Vygies are a family of jewel-like plants that are in full flower during September. 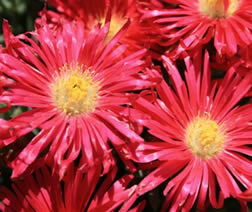 Vygies – or mesembryanthemums – are truly South Africa’s most colourful plant group. Their silky-textured flowers – in just about every colour of the rainbow – will give an extraordinary luminosity to any border. With more than 1 800 species from which to choose, whatever your taste in plants and garden design, there will be a vygie to suit your fancy. The widely used Afrikaans name vygie – which literally means ‘small fig’ – is based on the fact that the top-like fruiting capsule also resembles a small fig. 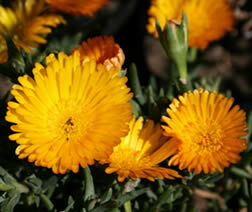 The best know spring-flowering vygies are the Drosanthemum, Delosperma and Lampranthus species. 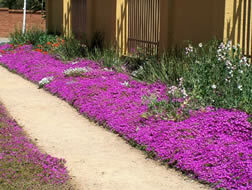 They include many small shrub-like plants as well as groundcovers, and have an enormous range of flower colours. Lampranthus species have smooth leaves, and large, shiny flowers. 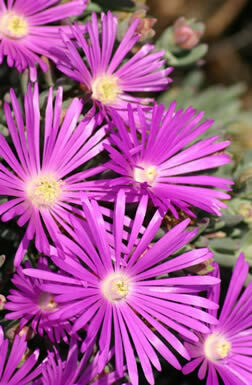 Delospermaspecies have conspicuous seed compartments, whilst the leaves of Drosanthemum species differ from those above because of their dew-like shiny cells on the epidermis – hence their common name, ice plant. The Livingstone daisy or Bokbaai vygie (Dorotheanthus bellidiformis) and yellow-bloomed vetkousie (Carpanthea pomeridiana ‘Golda’) are also spring-flowering but as they are both annuals, their seeds must be sown in autumn. Mat-forming vygies that grow easily in Cape gardens are the white to pink coastal vygie (Delosperma litorale), yellow carpet vygie (Jordaaniella dubia), pink carpet vygie (Jordaaniella anemoniflorus), pink Oscularia deltoides and magentacoastal ruschia (Ruschia macowanii). Shrubby, cushion-shaped or spreading vygies that grow easily are magenta-bloomed Darling vygie (Lampranthus amoenus), orange vygie (Lampranthus aureus), yellow vygie (Lampranthus glaucus), pink to magenta(Lampranthus multiradiatus), pink to magenta rose vygie (Lampranthus roseus), yellow-pink bell vygie (Drosanthemum bellum), pink coast carpet (Drosanthemum candens), pink Drosanthemum hispidum, yellow and red Worcester vygie (Drosanthemum speciosum), magenta Paarl rose vygie (Erepsia lacera) and magenta Piketberg vygie (Erepsia pillansii). Plant vygies in a sunny, well-drained position. Where drainage is a problem, rockeries and north and west-facing slopes are ideal sites. Vygies thrive in many different soil types, and need little nourishment. Perennial vygies can be planted at any time of the year. The hedgehog vygie (Delosperma pruinosum) will tolerate partial shade and even flower well. (Drosanthemum spp.) with cuttings every second or third year. This is because they are relatively short-lived. In general, the species that do not flower as profusely – such as Delosperma spp. – live much longer, and are a better investment for a low maintenance garden.